We asked one of our regular clients to share in their latest experience. 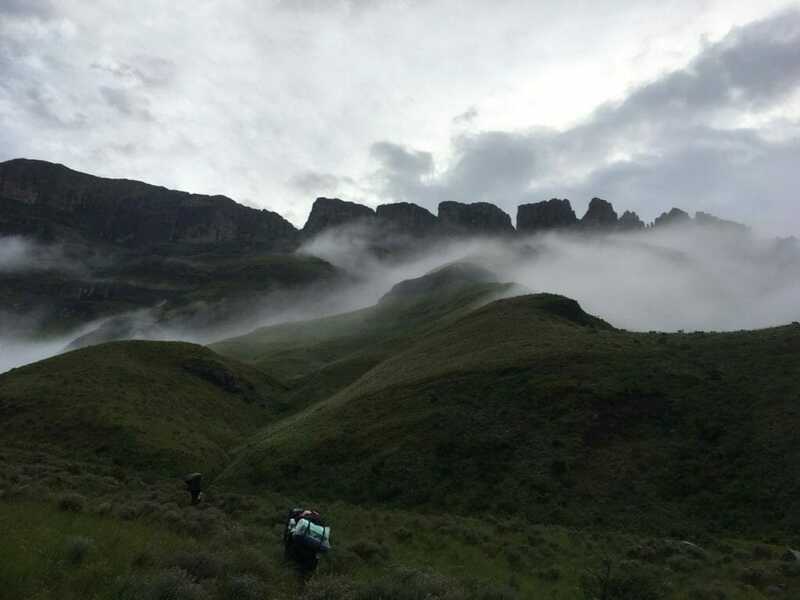 The hike was in the Central Drakensberg area and the objective was to get to the summit of the second highest mountain in South Africa known as Champagne Castle- a challenging yet rewarding trek with some incredible views. The camp for the 2 nights was nestled between the looming peaks of the Dragons Back, Champagne, Cathkin Peak and Monks Cowl. The camp known as Keith’s Bush Camp is the perfect spot for a summit bid. It is situated at the base of Grays Pass which is the only way to the top. 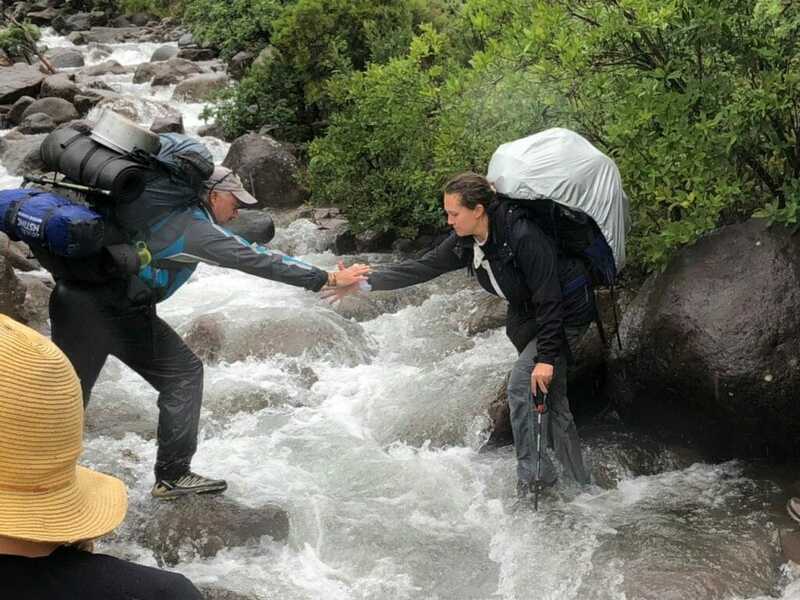 It is a challenging pass rising up nearly 1200m from the campsite to the summit. But the effort is well worth it. Not only do you get an incredible view of the valley below but on clear days hikers are privileged enough to spend some time with the soaring Cape Vultures. There are actually quite a few nests in the cliff face just below the gully that leads to the escarpment. Champagne Castle (the second highest mountain in South Africa) is located in the central Drakensberg range. The drive through Champagne Valley up to the start of the hike is littered with many picturesque B&Bs and Hotels that one is tempted to pull into for one last stop. But we didn’t, because we were there to trek a beautiful mountain, and my reward is the experience not the well-deserved glass of wine in the bath at the end of the weekend. After arriving at the start of the hike at the Monks Cowl Parks Board, checking and packing all of our gear, we were ready to begin our trek up. And that is how the Champagne Castle hike immediately starts… straight up. I found it required a great amount of leg strength, step after step, and after the first hour my energy levels started whispering to my mind. Can I complete today? Before I could conquer myself we found rest beside a waterfall, giving me time to eat an energy bar and drink pure Drakensberg water from the river. I suddenly found myself questioning what was beyond the next meandering corner and I felt my energy returning. This occurred many times throughout the day. The first part of the hike is pretty much uphill until we reach what is known as Blind Man’s Corner. A warning sign about the conditions and whether or not we have the correct clothing stood out for me. Was I biting of more than I could chew? But my confidence returned knowing that we had spent the time with the guide checking our equipment. The next 7km was pretty chilled out. 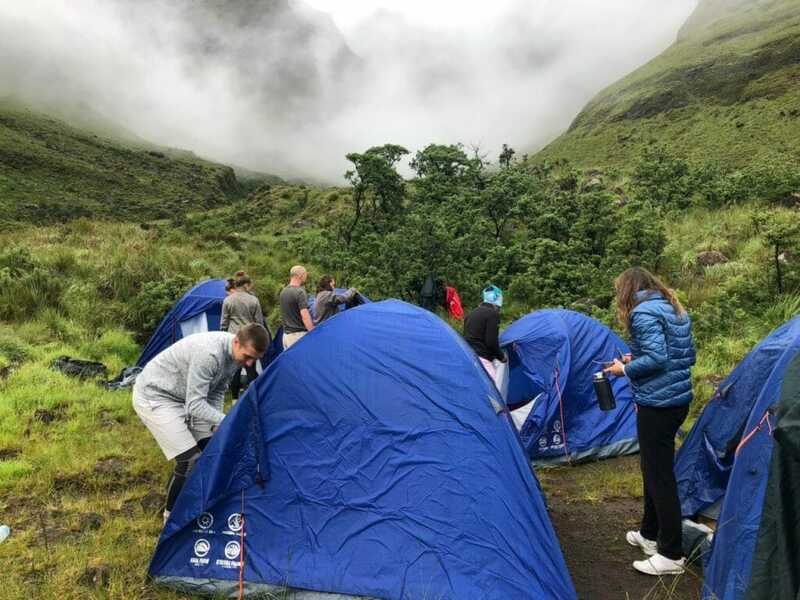 We contoured around the front of Cathkin Peak and down into the valley that leads up into our camp known as Keiths Bush Camp. The final push up the valley was a tad testing on us physically and mentally as it was getting dark. But in hindsight it was an exciting part of the hike. I had never trekked in the dark before. Our guide was super patient and his navigation into camp was spot on. The evening ended with a hot meal, even while it was pouring outside, and me taking refuge within my sleeping bag. Day two seemed like a new life. I survived the night and was able to crawl out my tent and say hello to the people around me. After a pleasant, social coffee gathering around the cooker followed by a bowl of oats, we were ready to head towards the summit, this time I had no baggage, literally. From the camp site to the summit is approximately 4km, straight up. In the beginning there was a spring in my step with the thought of only 4km in my mind, but little did i know that it would take us a good 4 hours to get to the top. The Pass we were to ascend is known as Grays Pass. It is the only access point onto the escarpment with a steep gully as the final test. Once on the escarpment, it’s a gentle 2km trek to the summit of Champagne. I say gentle but the effects of the altitude could still be felt. I mean 3300m is still pretty high if you asked me. All I can say about the summit of Champagne Castle is it is breathtakingly high and beautiful. I felt as if I was on top of the world and got a 30 degree view of the Lesotho escarpment. My eyes seemed to open up more and if someone proposed to me I probably would have said yes without hesitation. Cautiously we descended with the Dragons back on our left, and after warming up my knees, I found myself almost running down into camp. The cheerful campsite was a festive and happy spot given the remoteness of the Drakensberg, with hot casserole, coffee and sherry as our reward for a hard days hiking. The last day seemed long once again, but mentally I was secure, knowing I could do it. I was able to enjoy the beautiful things that I passed. I noticed the Drakensberg had a tremendous amount of pretty flowers and beautifully shaped sandstone formations and towers. Champagne’s greenery is unusually mysterious, filled with delicate and hardy plants. One could see why Tolkien was inspired by these mountains to write such fairytales. I felt in my element at last and realised that although it was a tough hike, I knew I would definitely be back. No you do not get porters bringing you chairs to sit on, but that is not the point. You are completely surrounded by nature. With no distractions you have the privilege to enjoy creatures fearlessly performing their daily rituals. What a blessing. A solid high five and a shot of sherry, brought the hike to an end. Arriving home, I dropped everything and left it for tomorrow to worry about. Champagne Castle left me with an adventure to remember, and a personal accomplishment that I can tell my children about one day.